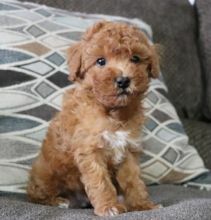 Toy Poodle puppies whit 5 generation pedigree 5 male and 6 femalesavailable . Pups they r big and strong microchip and vaccins up to date forthere age . , The pups will go to there new home whit vaccins microchip andpedigree. 🎄🎄 Email at ✔ ✔[ cartycollins@gmail.com ] or Text at (262) - 586 - 9580 for more details. .Toy Poodle puppies whit 5 generation pedigree 5 male and 6 femalesavailable . Pups they r big and strong microchip and vaccins up to date forthere age . , The pups will go to there new home whit vaccins microchip andpedigree.